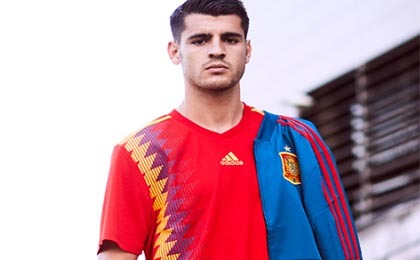 If you want to buy cheap spain shirt for 2018-19 season, buy it here in cheap-football.com , Check our exclusive range of spain Football Shirts / Soccer Jerseys and Kits for adults and children at amazing prices. Get the cheap spain jersey shirts, soccer kits with wholesale price, Free Shipping Worldwide! Spain national football team represents Spain in international men's association football and is controlled by the Royal Spanish Football Federation, the governing body for football in Spain. Spain has been a member of FIFA since its foundation in 1904, even though the Spanish Football Federation was first established in 1909. Spain's national team debuted in 1920. Since then, the Spanish national team has participated in a total of 15 of 21 FIFA World Cups and they have qualified consistently since 1978, the only UEFA team aside from Germany to do this. They have also appeared at 10 of 15 UEFA European Championships, having won a shared record with Germany, of three continental titles.Spain are one of eight national teams to have been crowned FIFA World Cup champions, having won the 2010 tournament in South Africa, defeating the Netherlands 1–0 to become the first European team to win the title outside Europe as well as having won back-to-back European titles in Euro 2008 and Euro 2012, defeating Germany and Italy in the respective finals. These three successive titles make them the only national team so far with three consecutive wins of either the applicable continental championship or the World Cup. From 2008 to 2013, a six-year span, the national team won FIFA Team of the Year, the second-most of any nation, behind only Brazil.Between November 2006 and June 2009, Spain went undefeated for a record-equalling 35 consecutive matches before their upset loss to the United States, a record shared with Brazil. The team's achievements have led many commentators, experts and former players to consider the 2010 and 2012 Spanish sides among the best ever international sides in world football.